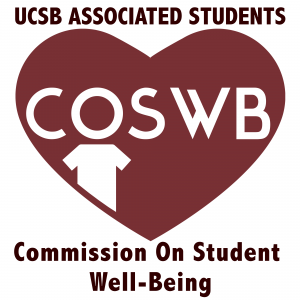 ABOUT US: The Associated Students Commission on Student Well Being (COSWB) is committed to the general well being of UCSB undergraduates, with a particular emphasis on physical, nutritional, and mental well-being. Its purpose is to increase awareness, educate, advocate, and serve as a reference point for student social services. COSWB creates programs that provide a positive and comfortable environment for everyone on campus in order to stay true to our values of appreciating and preserving student well being. Some events we host include, but are not limited to Yoga, Free Fitness Tuesdays, self-defense classes, meditation workshops, and paint night. GET INVOLVED: A.S. COSWB seeks to create and promote programs focused on preserving student well-being on campus. We are always looking for members and volunteers to help us to provide a more positive environment for our community. If interested, please contact us at as.coswb@gmail.com or come by our weekly meetings.